I've been having a little trouble getting into the Christmas spirit. It's been a whirlwind fall and there is a lot on my mind. December popped out of nowhere and I feel like i should have more done... be more aware that Christmas is almost two weeks away. Then I saw a billboard at Wegmans about Roc the Day. Aaron used the QR code and looked it up right away. I was intrigued. I had been thinking about giving for the holidays. There are book drives, toy funds and bell ringers for the season. But what else? 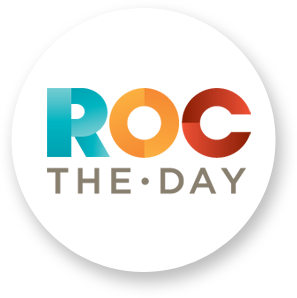 I was impressed to see that Roc the Day had pulled together a HUGE list of not-for-profits in Rochester and made it incredibly easy to give to them. You can browse through the groups or search for a particular one. I chose three organizations that are particularly important to me. Genesse Center for Arts and Education, Lollypop Farm and the YWCA. They hit three areas I especially care about - the arts, animals and empowering women. The Roc the Day site gives descriptions of the choices, with links to their websites, Facebook pages, Twitter accounts and YouTube channels! And you can give to them quickly, easily and securely! I love Rochester and I appreciate what all these groups do for our community and I am glad I could help out. And that feels right for Christmas. Thanks for sharing your experience with this! I've been posting to FB about it, emailing people, and distributing postcards - the Society of Women Engineers, Rochester Section is also participating. So heartwarming to see over $260,000 donated already today!